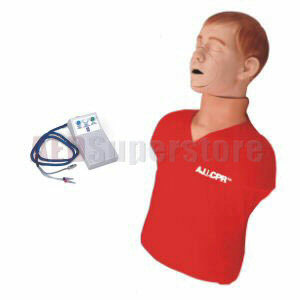 AJ Adolescent Manikin w/Electronics by Simulaids. AJ with Electronics provides the CPR trainee with feedback of their hand position, depth of compressions and ventilations. Adam comes with our patented ball/valve airway which replicates the occluded airway of the victim in need of CPR, and opens to allow air to lungs when proper chin lifts are applied. Features include: personal use channel mouth/nosepieces for each student, lightweight, portable, lifelike anatomical landmarks, carotid pulse, sternum, ribcage, and substernal notch. Soft carry case can be used as a kneeling pad when empty.